Expires Feb 28th, 2015. Not valid with any other offer. Excludes Gift Certificates, Catering Packages, and T-Shirts. $20 to spend at the Gourmet Ice Co. – can be spent in multiple visits. Dustin and Gina at The Gourmet Ice Co. pride themselves on homemade, all-natural, local, seasonal, and organic syrups. Their signature flavors are Blackberry Lavendar, Chocolate Sea Salt Caramel, Dreamsicle, Green Tea Vanilla, Hibiscus Mint, and Root beer, but that have a variety of seasonal flavors every week as well. Along with delicious Shaved Ice, you can also get Gourmet Hot Chocolate or Italian Soda’s! 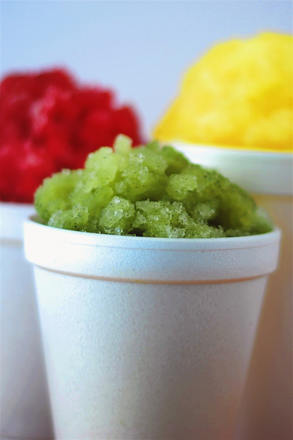 Dustin and Gina Graves at The Gourmet Ice Co. have reinvented the snow cone by creating the syrup in small batches using all-natural, local, seasonal, and organic produce. They use real fresh fruit, real fresh herbs, and real sugar. You’ll never see use any artificial colors, flavors, preservatives, or sweeteners!